Be the first to share your favorite memory, photo or story of Thomas "Greg". This memorial page is dedicated for family, friends and future generations to celebrate the life of their loved one. 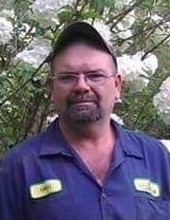 Greg Yarber 53, of Eatonton passed away unexpectedly on Sunday, December 2, 2018. He was born on June 6, 1965 in Sweetwater, TN to the late Thomas Ray Yarber and Judith Phillips Yarber. Greg was also preceded in death by his son Gregory Wayne Yarber, brother Chris Yarber, grandchildren Brooklyn and Bentley Knight. Vining Ivy Hill Chapel at 2 PM. He worked at Gro Tec as a mechanic for 15 years; Greg loved his family and friends very much and had a terrific sense of humor. He is survived by his loving wife Shirley Roberts Yarber, children Alicia Knight (Josh), Chris Queen (Kristen), Tasha Shead (Mike), Joshua Yarber, brother Mitchell Yarber of Sweetwater, TN, Niece Brandy Roberts, Nephew Brandon Roberts, Brother in law Stanley Roberts and numerous grandchildren. To send flowers or a remembrance gift to the family of Thomas "Greg" Gregory Yarber, please visit our Tribute Store. "Email Address" would like to share the life celebration of Thomas "Greg" Gregory Yarber. Click on the "link" to go to share a favorite memory or leave a condolence message for the family.